Nikon have managed to produce a truly amazing camera in the Nikon D3100 and at a price that is somehow still affordable. It has many of the same features of pro cameras that cost many hundreds of dollars more. The closest competitor to the D3100 is the Canon EOS Rebel T2i but this camera seems to have the edge over it. It’s clear that Nikon put all their effort into making a camera that produces great images and didn’t worry too much about the specs or any wacky features that won’t add much value. It has a 14MP CMOS sensor and uses the new EXPEED2 image processor engine. It is capable of shooting 1080p HD video at 24 frames per second but be sure to use a tripod because like most DSLR’s, this one too suffers from motion wobbles. The shutter speed on it is unbelievably fast so you will definitely get all the shots you could want. It replaces the D3000 model released before it and a number of the features are still the same such as the 11-point Multi-Cam 1000 autofocus system. It has 3 frames per second burst mode, a new image sensor as well as the EXPEED2 processing engine so it’s now capable of shooting from ISO 100 all the way up to 12800 at full resolution. 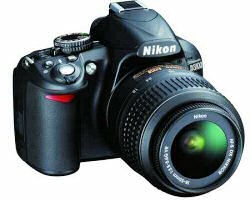 The Nikon D3100 is clearly aimed at first time or entry-level users. It has a useful guide mode that essentially teaches you step-by-step how to use all the features and buttons on the camera. It’s a small, light camera which is a big plus for traveling and on the back there is a 3-inch LCD screen which is bright and clear even in direct sunlight. It also has a viewfinder with a 95% field of view. The images produced by this camera are breathtakingly crisp, sharp and clear and the noise levels are very low. It can perform in near total darkness but it does have a pop-up flash just in case. One of the major features of the camera is it’s Active D-Lighting which helps to enhance shots with difficult lighting. It basically brings out the details in darker areas while preventing brighter ones from overexposing. The D3100 comes with a variety of effects including monochrome, vivid and portrait, all of which are highly usable and fun. A really surprising feature of this camera is it’s automatic image sensor cleaning which prevents dust building up on the sensor and dulling your pictures or ruining the detail over time. The controls on the Nikon D3100 camera are very well laid out and the menu system is logical, making it very easy to use, even for beginners. It supports all the major memory cards including SD, SDXC and SDHC. In this case it comes with a beautiful lens in the AF-S DX 18-55 VR, so you can get the Nikon D3100 + AF-S DX 18-55 VR lens kit. 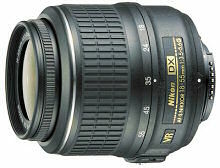 The Nikon Nikkor AF-S DX 18-55 mm f/3.5-5.6G VR zoom has compact size, the focus is fast and the lens has a silent wave motor. In addition, it has the Vibration Reduction feature, which is particularly useful in low light shots without using flash. 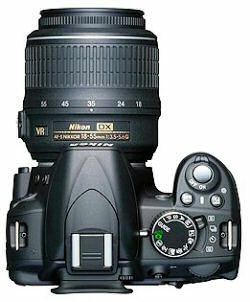 Mounted on a Nikon DX format digital SLR camera, the lens covers a focal equivalent from 27 to 82.5mm. It is an ultra compact, lightweight standard zoom lens with a 3X focal zoom range with vibration reduction, hence the VR in it’s name. It is incredibly sharp overall and very versatile. This lens and camera combo, the Nikon D3100 kit, is simply outstanding and will not hold you back in any way.